Are you looking for a police report translation services provider in Australia? When something bad occurs, a police officer would often make a report out of it. Did someone get into an accident or an incident? A police officer can gather the details and information about the accident. This is also another reason why they would interrogate or talk to a few people on the scene to have the whole 360-degree view of what happened once all evidence and information are gathered. The police officer can finally make a report. This would likely have information such as facts, timeline, and circumstances. Police reports are different for every agency. It is based on the protocol that the police should follow its format when writing one. Of course, function and information should be relevant. The first responder would write the report then submit it to the department to be filled and reviewed. 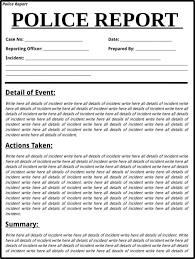 Police reports are usually used as a reference when officers continue to investigate. The victim can also use a police report as proof for insurance purposes. A report is sometimes used in court to assess the criminal charges that the defendant will face. If you’re looking for a police report translation services provider, then you’ve come to the right page! OPAL Translation has NAATI certified translators to help you. NAATI is the sole accreditation body for translators and interpreters in Australia. They also help maintain the high standards of translation in the country. After all, a simple mistake in a translation can lead to a lot of inaccurate information. Authorities often require NAATI certified police report translations. To avoid getting your document rejected, it is best to find a NAATI translator to handle your translation. OPAL Translation has NAATI certified translators for almost every language. Use our contact form or live chat to order your translation today, or simply follow the instructions below to get your document translated. If you are looking for NAATI certified translators, you’ll be delighted that all of our translators are NAATI certified. We have created a team of translators who have years of experience and are specialised in several fields including corporate, personal, medicine, engineering and a whole lot more. All of our translators ensure your document’s confidentiality and always work with professionalism so you can be sure that your documents are in good hands. You will be confident that your documents meet the high standards of Australia. For every translation project that we receive, we make sure that it passes our quality checks. While our translators ensure that your translations are translated accurately, our project managers recheck everything and look for any error. Once you receive the final translation copy, your document is accurate and high-quality. We guarantee a 100% acceptance rate in most, if not all, authorities in Australia. When it comes to customer service, we make sure that you will have a great time. All of our customer service representatives are friendly and available via email and live chat. We usually reply to your inquiries in just a few minutes via live chat and no more than 30 minutes via email. You can reach us 365 days a year, 24 hours a day and seven days a week. So what are you waiting for? Ask us your first question. Let us help you with your translation needs. Get a free quote today! Yes, you read that right. We provide free quotes. Check out our low rates by completing the translation form on this site and attaching a scan or photo of your document. We will send you your firm quote in less than 15 minutes. On average, our translators can translate most documents within 2 to 3 days. However, this can change depending on your document’s number of pages, complexity and language. In case you are in a hurry, we can expedite your project and finish it in no more than 24 hours using the express police report translation services. Yes. Our website is designed to accommodate your inquiries and orders via the live chat and the translation form. This removes the need for you to come to visit us in the office. Once your translation project is complete, we will send it to you via email. If you need a hard copy, we can send you the certified hard copy via Australian post. So feel free to go about your daily tasks and focus on what really matters. Are you interested in our police report translation services? If you answered yes, follow these easy and simple instructions. Get a police report translation services quote. You can do this by filling in the required details in the translation quote form and uploading your document’s scan or photo. In no more than 15 minutes, you will be receiving the exact quote in your email account. Proceed to pay for your translation project via credit or bank transfer. When your translation project is complete, we will send you a draft of your document and ask for you to review the said draft. If it is satisfactory, we will send you the final translation soft copy.